''Shift Cancellation Reasons'' section allows you to enter your cancellation reasons to the system in addition to the default ones. You can find this section on the System Settings -> Scheduling Settings > Shift Cancellation. 1. 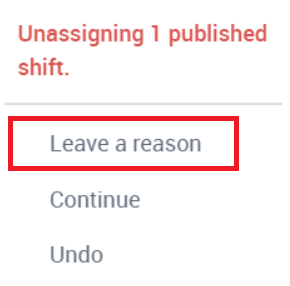 To add a new reason simply click on 'Add Reason', name it and Save. The reasons written in black are system default reasons which can't be edited, however, the reasons you have added are in blue and are editable and removable. 3. If you wish, there is also an option to add an absence to the person at the same time if this is applicable or to set them as unavailable. 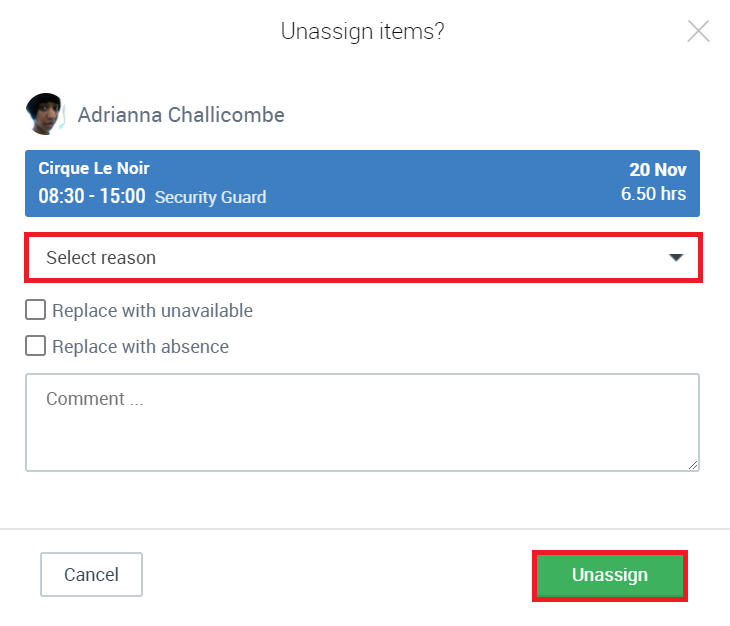 Once you have selected the reason and/or absence, click ''Unassign''. The shift will then pop back up to the top of the schedule as an open shift. This report shows you the statistics and gives an overview of all the cancelled shifts along with the cancellation reasons and absences. You can go there if you hover over the Schedule tab and from the drop down click on ''Cancelled Shifts''. 1. 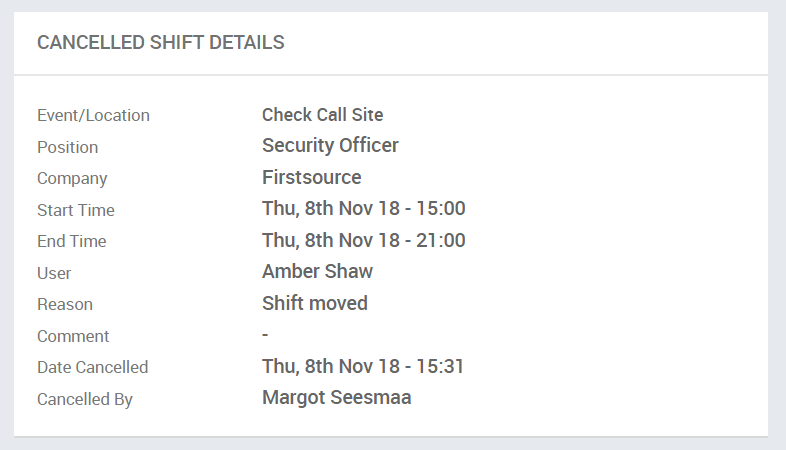 On the report you can see all the information about the shifts that have been cancelled such as the shift time, person's name, by whom the shift was cancelled etc. If you have chosen an absence and/or cancellation reason, it will be displayed here. If you haven't chosen them while unassigning a shift, it will show as blank on the report. 2. To see the shift details altogether, click on the person´s name and it will open up a box where you have all the information. 3. Use the filters to find more specific information about cancellations, for example, you can use Location filter to get an overview of the cancelled shifts in that particular location or can look up what shifts were cancelled due to a specific cancellation reason.